Are you a resident of Yucaipa, California suffering from flood and water damage? If so, call the professional cleaning and remediation experts at Superior Cleaning and Restoration Inc. to remedy your problems. We are an all in one shop for water and flood damage remediation and restoration. From dryout remediation, to reconstruction and remodeling, our service members can handle the toughest water and flood emergencies you can throw at us. Yucaipa has a warm-summer Mediterranean climate that leads to pleasantly calm weather. You would be surprised to learn that nature is not the main culprit for flooding. Broken water pipes, spilled water containers, and residual leaks are the main culprits for water damage cleanup. Our experience and years of superior service gives us an edge against other contractors. Call today for a free quote to get started on your water damage cleanup. Does Superior Cleaning and Restoration Inc. offer reconstruction services for water and flood damage? The professional cleaning and restoration experts at Superior Cleaning and Restoration Inc. are fully prepared to handle every aspect of your flood and water damage cleanup. We are fully licensed to complete reconstruction and remodeling on your residential or commercial property. We pride ourselves on our superior service and will leave your property in a superior state. Do you accept major insurance companies? We do. Superior Cleaning and Restoration Inc. is a full service company that accepts many major insurance companies. We will even work with you if you do not have insurance. This enables us to help every resident of Yucaipa. Although Yucaipa, California is known as the home of the Stater Bros. market chain, it is much more than that. The community is working hard to revitalize the downtown area and bring in better businesses. 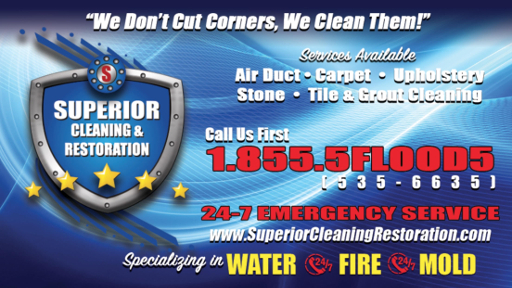 You can now find superior water damage cleanup service from Superior Cleaning and Restoration Inc. in Yucaipa. We have you covered 24/7, accept many major insurance companies, and will help you restore your property from the beginning to the end of the project. You can rest easy knowing the professionals at Superior Cleaning and Restoration Inc. are restoring your property. Call now for a free quote.